Padlock! is a game app. by Ryan Moulton where your purpose is to “pick” a lock, or more accurately, figure out the combination to a lock by listening carefully to the quiet clicking sounds that the numbers make. This might be easy if it were not for the sounds of traffic, horns, rain, footsteps, dogs barking, bells, change dropping, etc. in the background. It is more of a listening game than anything- the game advises that you wear headphones while playing so you can hear better. I tried the game both with and without headphones, and for me it was impossible to play without them. I needed the volume all the way up and my headphones on to even have a chance (even on the easiest mode) and I have perfect hearing. It gets harder to hear in the more difficult modes- I stayed in “Picklock” (Easy) because I found that “Locksmith” (Medium) and “Safecracker” (Hard) were both too difficult for me. There is also an option to play in “hint mode” where the click sounds are all the same, but after you make a guess, the game tells you how far off you are from the actual combination. To me, this seems more difficult in a way, because you basically just have to start with a random combination and then try to move towards the correct one by trying to close the gap between your number and whatever the actual combination is. The lock itself is a simple combination lock that looks like one that you’d use for a locker at school or the gym. Figuring out the combo to this type of lock definitely doesn’t make me feel like a “Safecracker”- just more like a petty thief or vandal. I didn’t feel like I had truly accomplished anything once I figured out the combination in 4:44- seemed like a lot of work for a weak payoff. Especially since I had to play with headphones on in my room with complete quiet. If you are out and about and want to kill a few minutes by playing on your phone or iPod, I don’t feel like this is the app. that you’d turn to. Perhaps if the game had more than one type of lock, or if you felt there was more “danger” involved in picking the lock, it would be more fun. But as is, I wasn’t too impressed. Also, I wish the background would change- the whole time I was playing, I only had one background (a cobblestone street at night). Maybe if I felt like I was traveling the world and picking locks, it would be different. But instead I felt like a punk kid terrorizing the combo locks of one street over and over again. 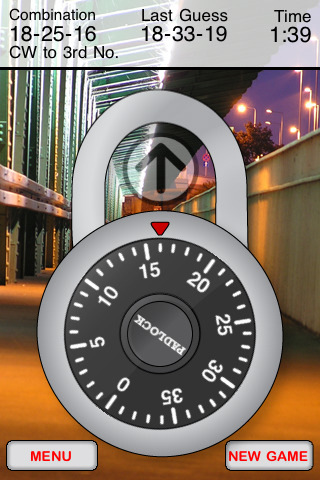 Keep in mind that this is a FREE app.- if you are into games of concentration that involve careful listening, then download Padlock! and start cracking those combinations. AppSafari review of Padlock! was written by Tyne Kennedy on April 13th, 2010 and categorized under App Store, Free, Games. Page viewed 5162 times, 1 so far today. Need help on using these apps? Please read the Help Page. This app is not in the appstore.